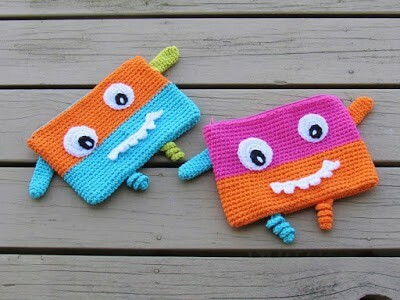 I am excited to present this cute Back to School Monster pencil case! Every year I think of coming up with a Back to School project and end up finding no time. 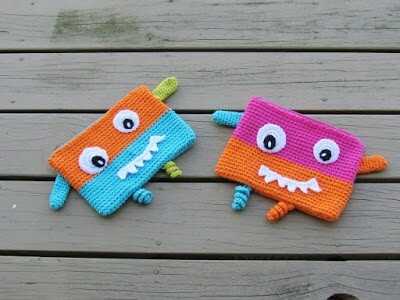 I made the one in blue and orange first and my little girl loved it. She requested one in pink and orange, so I whipped up a second one. Made using mostly single crochet stitches and cotton worsted weight yarn, it turned out pretty sturdy. I am sure this will keep the kids entertained in their free time. You will need a matching zipper for the pouch. I didn’t find an orange zipper and had to use a blue one. If you are intimidated by the zipper, the pattern explains in detail how to attach the zipper. Hey, there is a first time for everything! You can do this. 1. Worsted weight ( size 4 medium) yarn, preferably cotton. 4. Thread and Sewing needle for attaching the zipper. The pencil case is worked bottom up. The pattern is written for the blue and orange case. 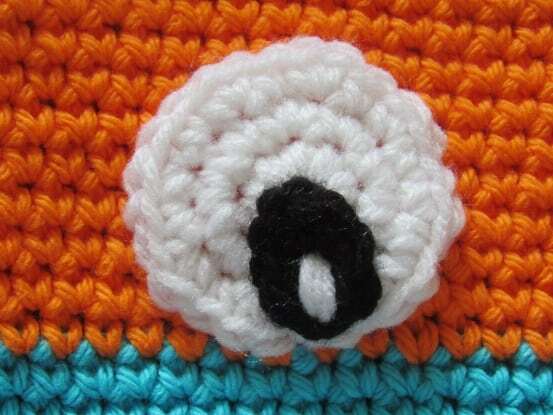 To place a marker in a stitch, pull a piece of contrasting color yarn through that st. Using H hook and blue yarn, chain 66. Without twisting the chain, sl st to the first ch. Now work a sc into the marked st and move the marker up into this stitch you just made. The marker indicates the first stitch of a round. Then keep on working 1 sc in each stitch. Every time you work into the marked st, move the marker up. Repeat till you have 11 sc rows, sl st to the next st and fasten off. Join the next color orange with a sl st, ch 1, 1 sc in next st, place a marker in this first sc, 1 sc in each st around. Do not join at the end of the round. Then keep on working 1 sc in each stitch just like you did with the first color, taking care to move the marker up at the start of each round. Sl st to the next st and fasten off. With H hook and white yarn, ch 4, sl st to the first ch to make a chain ring. Pull the beginning tail to close the hole in the center and weave it in behind your work. With F hook and white yarn, ch 4, sl st to the first ch to make a chain ring. With F hook and black yarn, Ch 4, 1 sc in 2nd ch from hook, 1 sc in next chain, 3 sc in last ch, pivot your work and work in to free loops of the foundation chain, 1 sc in each of the 2 free loops, sl st to the beginning ch-1. Fasten off with a long tail for sewing. With F hook and black yarn, Ch 3, 1 sc in 2nd ch from hook, 3 sc in last ch, pivot your work and work in to free loop of the foundation chain, 1 sc in the free loop, sl st to the beginning ch-1. Fasten off with a long tail for sewing. Note: All the teeth are worked in one single piece and you should not fasten off after each tooth. Step 1: With F hook and white color yarn, ch 4, sl st in the 2nd ch from hook, 1 sc in next, 1 dc in next. ———Small tooth made. Step 3: Ch 5, sl st in the 2nd ch from hook, 1 sc in next, 1 dc in next. ————–Small tooth made. Repeat steps 2 and 3 until you have 6 teeth. Ch 1 at corner and sl st along the top of the tooth. Fasten off with a long tail for sewing. With F hook and blue yarn, Ch 4, sl st to the first ch to form a chain ring. Now, pull the beginning tail to close the hole in the center, make a couple of knots on the wrong side of your work and trim the excess. Keep working 1 sc in each sc till your work measures 3 inches, sl st to the next st. Fasten off with a long tail for sewing. Make one more in green color. With F hook and blue yarn, ch 16, 3 sc in 2nd chain from hook, 3 sc in each ch across. Fasten off with a long tail. Note: The bottom is sewn shut only last after sewing on all the features and the zipper as well. Firstly, weave in the beginning tail on the black parts of the eyes. Place the bigger black patch on the bigger white patch, right on top where the long yarn tail comes out, sew it in place going around the rim. Repeat with the smaller eye. 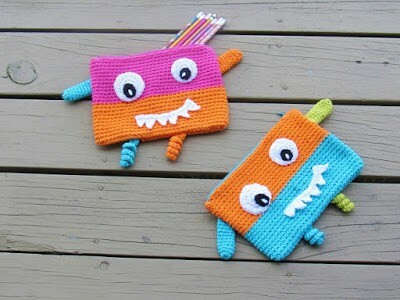 Position the eyes on the pencil case and use the long tail to sew the white patch on to the case. After you have come full circle, sew three white lines on to the black patch for the pupil. Sew along the top of the teeth. You can sew down each tooth if you want. Position each spike behind the pencil case and sew it down going through both the layers of the spike and the back layer of the pencil case. If the zipper is too long for your pencil case, you can always make it shorter by sewing a new stopper with matching thread. You will sew around the teeth of the zipper many times. Leave an inch of the tape after the new stopper and trim the excess. You will be using regular thread and needle, yarn needle will not go through the zipper. 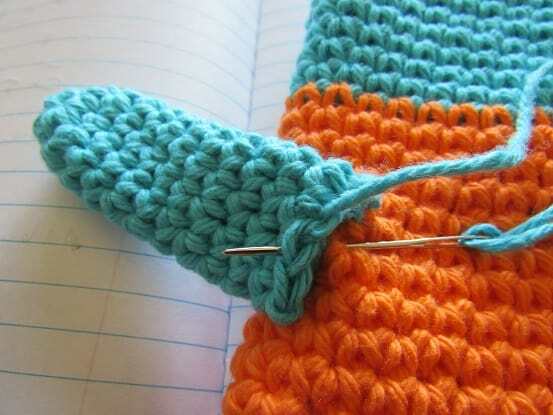 Insert the closed zipper into the top opening of the pencil case, place the pull close to the left corner, tuck excess tape inside, the edge of your crochet should touch the teeth of the zipper but not overlap it. Pin in place and make a basting stitch ( big stitches just to hold it in place) using contrasting color thread. See pics 3 & 4. You use contrasting color as these stitches will be pulled out later. You can also directly sew it without pinning. When you reach the right corner, tuck the excess tape inside and work through all the 4 layers, two layers of zipper tape and two layers of crochet as shown in pic 5, go back and forth a couple of times. Now open the zipper, align the back of the pencil case along the zipper teeth and sew. When you reach back the pull side, close the zipper, tuck the excess tape inside and work through all the 4 layers like you did at the previous corner. Knot the thread and finish off. Now that you have positioned your zipper, you can back stitch with matching color thread. At the corners, you will go through all the 4 layers like you did before. Cut out your basting stitches. Place a marker at the bottom right side of your pencil case as shown above. This will indicate where the corner is. Open the zipper and turn your work inside out. From the marker, start slip stitching the two layers together, when you have covered 1/3rd of the length, insert a corkscrew and continue to sl stitch while locking the corkscrew in place. Once you have covered 2/3rd of the length, insert the next corkscrew and sl st till end. Fasten off and weave in the end. 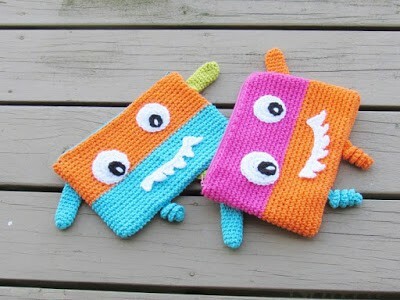 Turn your work inside out again and your cute Monster Pencil Case is ready for use. If you love it, kindly share it using one of the social media buttons. Thank You.